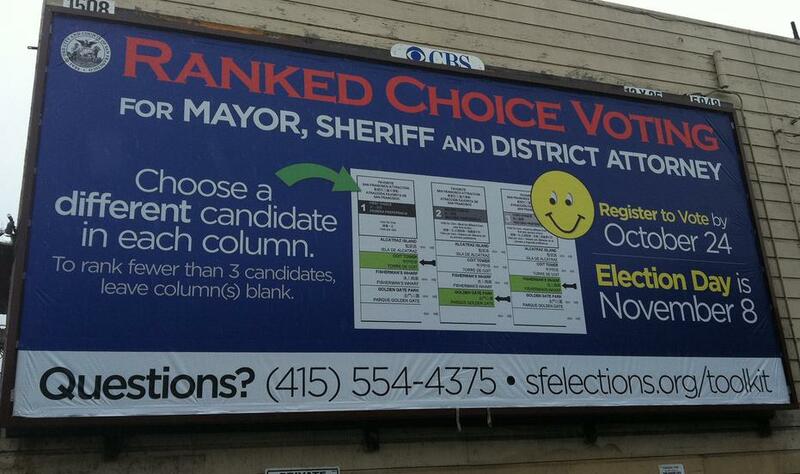 In the weeks leading up to the November 8 election, San Franciscans find themselves up to their necks in news articles (from the Chronicle, the Mercury News and even The Economist) about our ranked-choice voting (RCV) system and how the tallying of voters’ first, second, and third preferences might affect the outcome of the mayoral election. In principle, ranked-choice voting is simple: If no candidate receives an outright majority of the first place votes, the candidate with the fewest votes is eliminated and his or her votes are redistributed according to those voters’ next choice. The votes are re-tallied, the lowest vote-getter is eliminated, and so on. In what amounts to an instant run-off, this process of redistributing ballots continues until a winner is declared. As someone who studies voting systems (and spends free time poring over data from recent elections), I find the level of interest in RCV somewhat astonishing. Not long ago, the switch to using it seemed irrelevant to election results. Though San Francisco adopted this voting system in 2002 and it has been in place since 2004, prior to last year’s election, every candidate that led on the initial “first place” rankings was ultimately victorious. Sure, there were some close races, but most leading candidates saw their relative share of the vote increase in subsequent tallies. Only Supervisor Eric Mar had to sweat out the tallies of second and third place votes before ultimately emerging victorious. As a result, the consensus was that ranked-choice voting was just like a plurality system: the leading candidate would end up winning. The 2010 election changed everything. The mayors of Oakland and San Leandro, Jean Quan and Stephen Cassidy, respectively, and two members of the San Francisco Board of Supervisors, Malia Cohen and Mark Farrell, came from behind to win. That is to say, they did not initially lead the race when first place votes were tallied. Supervisor Farrell and Mayor Cassidy won exceptionally close races. Both narrowly trailed in the first round and narrowly won in the end. And Supervisor Cohen came from third to first in a deep field of 22 candidates. But the real shocker was the Oakland race. Mayor Quan trailed by a whopping 9 point margin (33.7%-24.5%) and ended up winning by two points. A new conventional wisdom was born: that ranked-choice voting could jumble an otherwise orderly election. Just Google “ranked-choice voting” and “wildcard” and you’ll get a sense of this new fascination. Willie Brown opined recently that it might be preferable for a candidate to be in second place after the initial tally. The empirical data, however, are far less interesting. They don’t reveal any secret voodoo to voting in a ranked-choice election or tricky ways to game the system. Here’s what we know: In a very close race, second and third choices can indeed tip the outcome. But clear frontrunners win — and usually expand their margins of victory. First, voters in Oakland exercised all of their choices. Nearly 80 percent of voters cast a ballot with three unique choices. Typically, in San Francisco only about half of those who cast ballots in an RCV election vote for three different candidates. The other half do something else, like vote only for their first-place choice or perhaps only for first and second place — some even vote for the same person three times, hoping their vote will get counted more than once (it doesn’t). As a result, ballots are more likely to be “exhausted” in San Francisco (i.e., they do not accrue to any of the candidates remaining in the race as the field narrows) than was the case in Oakland. For example, in Oakland 88.4 percent of votes ended up continuing to the final round of tallying in 2010. In San Francisco’s four competitive races last year, only 81.8 percent of the ballots continued to the final round — 77.7 percent in Supervisor Jane Kim’s race, and just 46.0 percent in Cohen’s. In a survey that we at the University of San Francisco conducted with the Bay Citizen, only around half of those surveyed expressed a preference for three different candidates in the current mayor’s race. This means that if people vote in the election the way they did in the survey, we can expect a lot of exhausted ballots — and that means fewer chances of an unexpected upset. Second, in Oakland, there were three leading opponents of front-runner Senator Don Perata. For voters who wanted to cast a ballot for “anybody but Perata” (and there was a vocal contingent opposed to him), it was easy to do so. Candidates Jean Quan and Rebecca Kaplan even adopted the “anyone but Perata” approach and encouraged voters to put each other second. In San Francisco this year, voters who oppose the perceived frontrunner, appointed Mayor Ed Lee, have 15 other options, including three citywide elected officials, a state senator, and two current and three former members of the Board of Supervisors. This long menu of choices will likely water down the opposition. Again, we can expect a lot of discontinued ballots. And third, Perata was uniquely polarizing. Though he led the first place tally by 9 percentage points, he appeared on 8 percent fewer ballots than Jean Quan. Head to head, she was preferred to him. It wasn’t a fluke, she wasn’t lucky. She was preferred by voters. Ed Lee is not nearly as polarizing a figure as Don Perata. In our survey, 78 percent of voters expressed support for his job as acting mayor. That number has certainly fallen in the past two weeks as the campaign has heated up and allegations have been leveled against the organizations supporting the mayor. Still, it’s not yet clear that he will engender the kind of opposition needed to defeat a leading candidate. All of that is to say that ranked-choice voting is not random. As with other voting systems, it favors incumbents and frontrunners — and that most certainly benefits Mayor Lee in this race. It’s also true, however, that RCV doesn’t inherently produce the kind of outcome that the old two-stage runoff used to, i.e. one in which the winning candidate receives an actual majority of votes cast. Because of the high number of exhausted ballots in these elections, the candidate left standing at the end of the tallying is most commonly a plurality winner, meaning they may have gotten the most votes, but they didn’t get more than half. Of the 15 elections that came down to RCV in San Francisco since the voting system was adopted, 13 of the winners ultimately did not receive a majority of the votes cast in the election. Only Assessor Phil Ting (2005) and Supervisor Scott Weiner (2010) ended up with a true majority. That’s much less problematic in low-profile races. But it seems to me that the most pressing question for those of us interested in effective political leadership is whether the next mayor — be it a frontrunner like Ed Lee, City Attorney Dennis Herrera or Supervisor John Avalos, or someone else from the field — can effectively govern after winning an election by something less than a majority of the ballots cast. Corey Cook is an associate professor at the University of San Francisco, where he teaches American politics and conducts research on election results and political geography in California.